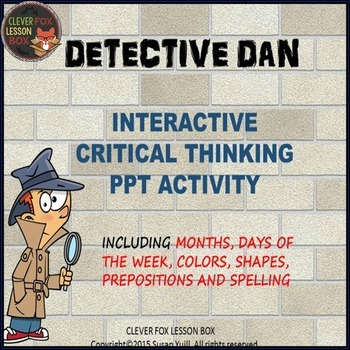 Critical Thinking Game: Early Learning Detective Dan is a critical thinking interactive activity that incorporates PPT and Printable Worksheets. Includes Colors, Months, Shapes, Spelling, Puzzle Solving, Reverse Order and Memory Activities. 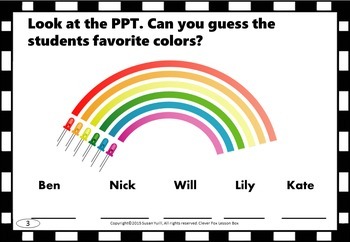 Students watch the PPT slides and answer the questions on their worksheets. 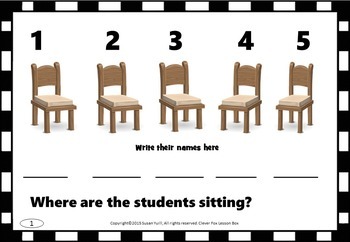 Suitable for grades 1,2 and 3. Please view "Preview Video" to check suitability. For a more difficult activity, try the Detective Dan IQ activity link here Detective Dan IQ Quiz PPT..
All of my PPT activities are created on Microsoft Office 2013. If you are worried about compatibility you can downloadfree Microsoft power point viewer..